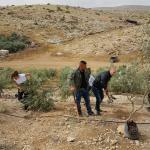 On Monday April 23, the Israeli military arrived with bulldozers to the lands of the people in Bardala, in the northern Jordan Valley and went ahead uprooting 320 fully grown olive trees in one day. In response, the Stop the Wall Campaign teamed up with the Palestinian Farmers Union, the Popular Council for the Protection of the Jordan Valley and the Tubas governorate and organised only 48 hours later a volunteer day to replant at least part of the trees that have been destroyed. Volunteers from the district and other places came and together with the villagers from Bardala replanted 120 olive trees in the exact location where the old trees had been destroyed. This is yet another form of struggle of the Palestinian people, keeping steadfast tending to their lands against all repression and destruction the Israeli military brings upon them in order to abandon their land and homes and accept to be forced into exile or caged in within the ghettoes delimited by the Apartheid Wall. Bardala has been since long under frontal Israeli attack and resists heroically the cruelties. Almost exactly one year ago, on April 27 2017, 40 Israeli soldiers raided the village of Bardala with 4 bulldozers and informed the locals that all their water outlets will be closed. But the villagers fought back and organised the March for Water.